Join our "best place to work"
Ready to join our JHNA team? 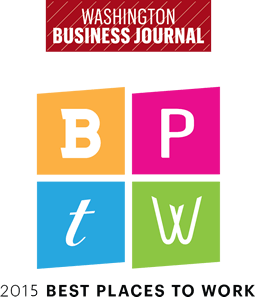 JHNA: Named a Washington Business Journal "Best Place to Work" 2015-2018! An engineering services firm, particularly one providing high-end expertise like ours, is only as good as the people it employs. JHNA is fortunate that we not only attract elite talent but retain them long after contracts have ended. We strive for long-term team development where each member finds with us a rewarding and engaging career. Our dedication to hiring superior talent while fostering an open and collaborative work culture has enabled us to excel and grow exponentially. It has also earned us awards in the form of Best Places to Work, year after year.